Tired of doing your dirty laundry? Not enough time in the day? Let Clean City do it for you. One phone call does it all. We provide FREE Pickup and Delivery laundry services at your home or office. Clean City is the cleanest laundry in the Dallas metroplex. Period! Our friendly staff is always here to assist you with a smile, when it comes to your Garland laundry service needs. Come experience what sets us apart from the rest. You will be glad you did. Clean City ...come dirty, leave clean! FREE Pickup and Delivery. Let us pick up your laundry and dry cleaning then deliver it back to you cleaned, folded, fluffy and ready to go. Visit the Cleanest Laundromat in Garland. With different size washer up to 8 loads, always attended with friendly staffs, FREE coffee and WiFi, Flat Screen TV's, Games and Snack Machines, well lit and Cool AC, you will see why we receive the best online reviews. Don't have time to do your laundry? Let us do it for you. We will wash, dry, fold, and neatly bag it. Your laundry is ready in two days. Same Day Express and Next Day services are available. We will pick up and deliver your linens, towels, uniforms, and laundry free of charge. We also process and rent linen for Weddings, Cooperate Events and so on. We Wash and Iron linens for Event Planners and commercial accounts using our Heavy Duty Commercial Laundry Machine and Flat-work Iron. We also rent Linens of different sizes and shapes for all occasions. Must be in by 2 pm to guarantee it will be ready by 9 pm. 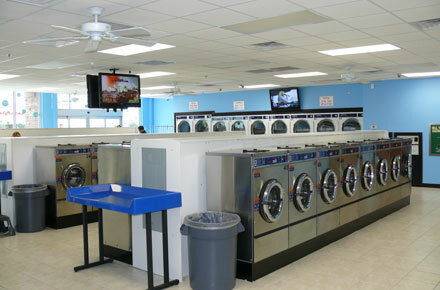 CleanCity is a unique and one of a kind laundry that has combined both walk-in laundromat and commercial laundry service using the highest-quality and most efficient laundry equipments in a cozy, clean and relaxing environment that provides first-class amenities, such as free WiFi, big flat-screen televisions, free coffee, game machines, drink and snack machines, His and Hers. My dryer broke unexpectedly and brought in my clothes to dry. Staff was amazing! They even offered to help me fold the larger items since I was by myself. Clean and VERY well run. Friendly staff and when they found out my dryer broke they told me they also offered a drop off service. LOVE THIS PLACE. After out washing machine went down a couple of weeks ago we started coming here and the experience has been great. Very clean with every size washers and driers for any need. The attendent thats there at noon on Sundays is awesome and explains things very well. Probably wont go anywhere else as long as I live in this area. Great job! Very clean. Lady who works there was super nice. AC was working and they had alot of ceiling fans as well. This laundromat is kept very clean and has an attendant on site. They offer very reasonable drop of laundry service or you can do your own laundry there. The machines have credit card readers so if you don't have change that's handy. They also sell any laundry stuff you may need. There are comfortable seats for you to relax in while waiting for your laundry to finish. I usually go on Sunday evenings normally 6:30 pm and it's been a long hard work week and I got a ton of laundry. The staffs will always ask if they can assist me. And also once you start going there a while, If you forget you card, they can start the machines and put it on your tab and you can just pay by debit card at the very end which makes it really convenient. I don't know the staff but they just goes above and beyond. Completely prepared for one of those coin laundry experiences. Instead, clean facility, easy to find, staff helpful converting my rolls of quarters into their card payment system. Bright spotless, a much better experience than I had hoped for.